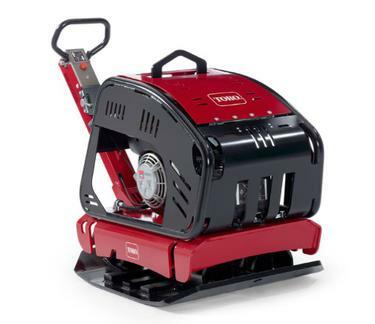 Toro's forward and reversible plate compactors are durable and produce a powerful tamp on the jobsite. The patented plate design is made of one piece that includes an extra large oil reservoir that dissipates the internal heat to the entire plate surface. The drive system is synchronized and transfers a large amount of eccentric force to ensure a smooth finish. The patented eccentric sheave is offset which dramatically reduces belt stress and extends component life. A patented sprinkler system sprays a sheet of water to prevent asphalt from sticking and reduces dust when using the machine in dirt. 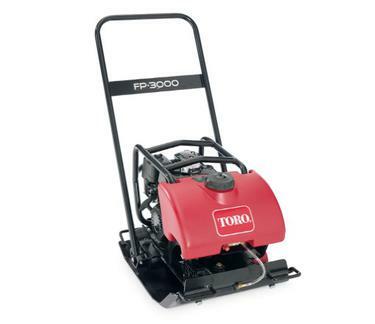 Toro's forward and reversible plate tamper models are listed below. Financing programs available like $0 down and no payments until July or 0 percent interest for 42 months. Other programs available too! $0 down and no payments until July on Toro Tampers!